With an emergency room physician as the creator and overseer, the software is tailored specifically to meet the many and complex facets of scheduling the work for emergency providers. ByteBloc software has been implemented by emergency rooms in all 50 U.S. states, Canada, and several other countries. ByteBloc was the top-rated physician scheduling software in a review done by ACEP's Section of "Computers in Emergency Medicine". 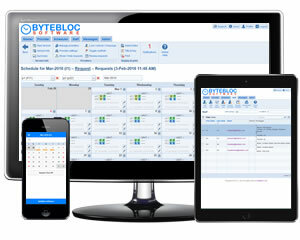 The ByteBloc software is also easily adaptable to the scheduling needs of groups outside of emergency medicine. "I have been a ByteBloc fan for years. The ByteBloc customer support team shines. They provide high quality, personal, attentive, effective, impeccable service that far exceeds my expectations. Would highly recommend this product to anyone looking to create workable customized schedules for their group and easy to use payroll information. You will have the best customer support you have ever experienced."